Shelter Island students on a scavenger hunt for edible plants at the Sylvester Manor Educational Farm. It was a busy Friday at Sylvester Manor when elementary school students descended on the farm field in early morning to learn that the staff was preparing for the first Community Supported Agriculture (CSA) pickup scheduled for the following day. 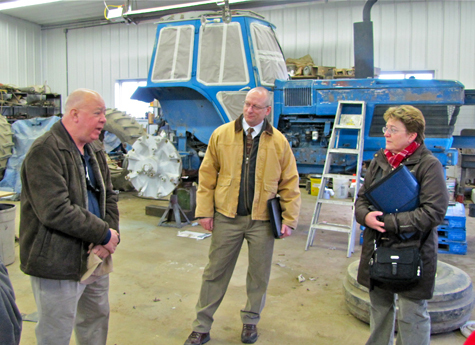 Local farmers and researchers hope a visit by the dean of Cornell’s College of Agriculture and Life Sciences Saturday will result in increased funding and research for the East End’s agricultural community. The Long Island Farm Bureau and Cornell Cooperative Extension arranged Dean Kathryn Boor to tour the Phil Schmitt & Son Farm in Riverhead, C J Van Bourgondien, Inc. greenhouse in Peconic, Bedell Cellars winery in Cutchogue, and Cornell’s research lab on Sound Avenue in Baiting Hollow. And it sounds like they might have achieved their goal. Ms. Boor said afterward that she’d never been this far east in New York, although he mother went to college in Farmingdale 70 years ago. “The scale of agriculture here is above anything I might have expected,” Ms. Boor told a reporter. Joe Gergela, executive director of the Long Island Farm Bureau, said the goal was to show Ms. Boor examples of the different types of local agriculture. As dean of Cornell’s College of Agriculture and Life Sciences, Ms. Boor is a powerful person in the ag instrustry, and can be instrumental in helping Long Island farms get grant money and access to Cornell’s research, Mr. Gergela said.